Resident Evil’s sudden drop into doing Rail Shooters comes off as a bit ironic in my mind. When the first Resident Evil came around, it was a hit because it involved shooting zombies in a context where you didn’t have to put in two quarters every time you get hit three times. After that, the series continued going with a story that was so outrageous it made Joseph Campbell spin in his grave, and yet, we all accepted it subconsciously for one reason: at least it’s better than House of the Dead. Now, here we are with Resident Evil relatively doing the formula of House of the Dead with its Chronicles series, which raises a big question: has Resident Evil become the new House of the Dead? I don’t want to go so far as to say that, but at least Resident Evil tries new things. 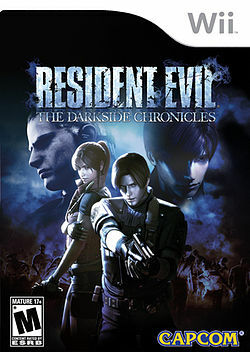 On the time-line of Resident Evil, if you are still keeping track, Darkside Chronicles takes place before Resident Evil 4 with Leon Kennedy on his first mission with his partner, Jack Krauser, taking down a possible viral outbreak in South America. Krauser, still new to fighting zombies and mutated super-grasshoppers, asks Leon to divulge every bit of information of his past experiences with Umbrella Corporation. The game then turns into a condensed version of Resident Evil 2 in the middle of the viral outbreak of Raccoon City during Leon’s first day on the force. Later on, the game returns to the South America incident to reveal that the new viral outbreak is a new strain of the Veronica Virus, transitioning things to a condensed summary of Resident Evil: Code Veronica. Finally, the game resolves in an epic gunfight in the South America incident. In short, Darkside Chronicles is a Rail Shooter version of two old Resident Evil games woven into a new story. The Rail Shooter gun play is very identical of the scheme used in Dead Space: Extraction, almost to the letter. If enemies pop up, point the cursor at them and hit Fire until they fall over, then hit Fire again until their heads explode. You keep firing at enemies until you make it to the end of the chapter, then you repeat until you win. If I was charitable, I would say that Darkside Chronicles was an Extraction clone, but I think we can excuse comparison to other games for the sake of not sounding like snoots. The differences are however, worth noting. Extraction’s bosses were few and far between but challenging nonetheless, especially if you don’t have the right weapon to even damage it and are stuck with your basic gun the whole fight. Also, there are more opportunities to pick up ammo and new weapons, which is good, because if you pick up a new weapon and you already have four, you have to either drop the new one or one of your old ones. The enemies also attack in more frantic swarms, making firefights intense, especially when there’s little indication as to when they’ll attack. Darkside Chronicles on the other hand, is the antithesis to Extraction. The zombie attacks range from piss easy to somewhat challenging, and use the old Rail Shooter problem of giving you one tenth of a second to shoot something before it hits you with a cheap shot, which will happen often. The Boss monsters, admittedly more diverse than Extraction’s Necromorphs, are unforgiving in difficulty, even in normal mode, and fight you back-to-back. Honestly, I had to fight three Boss monsters with no checkpoint. By the end, I only had my pistol, no herbs and a sliver of health. Speaking of weapons, in Darkside Chronicles your weapons stack. You can have four ready to go but the rest of your arsenal is only a pause screen away, and your ammo resets at the end of each chapter so there’s no need to be conservative with certain weapons. As stated before, the easy access to your weapons and reset ammo is balanced by cheap shot enemies, torturous Boss monsters, and the fact that your healing items also reset to zero at the beginning of each chapter. As a nitpick, there is no trick to make your weapons reload faster in Darkside Chronicles. Let’s say you are reloading your shotgun while two plant creatures are coming after you. You have to wait until you are done reloading your entire clip before you can fire. Think about that for a second. You are being attacked by monsters and you are taking five seconds of vulnerability just to load a shotgun? You can’t even reload two shells then fire, you have to willingly wait until nothing is attacking you to reload, which is most likely one second less than the time you need. The environments are nicely done. Raccoon City has gone to hell, the sewers are wet, South America is a bit reminiscent of RE5’s Africa but the zombie piranha give it it’s own personal level of hell, and the Umbrella factories are a bit copy and paste but still exciting to play. The writing is still your standard Resident Evil affair, the voice-acting still hasn’t improved for the most part, but it gets the job done. The cut scenes from a graphic standpoint, are exceptional and the in-game graphics are Wii quality, as in above PS2 but not good enough to be considered 360/PS3 quality. In conclusion, Darkside Chronicles is a hard game, but it does have its selling points. For instance, I didn’t have to play Resident Evil 2 and Code Veronica and go through the stupid stories of both all the way. True, you will die a lot through some reload problems or because you didn’t fire fast enough but it’s not all bad.